ArcelorMittal provided 20,000 tonnes of rebars for the Nowa Lodz Fabryczna station in Poland, the third largest railway station investment in Europe. 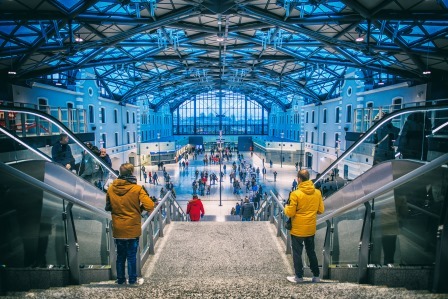 The new railway station located in the city of Lodz (130 km West of Warsaw) replaces the old historical train station. It is one of the biggest ongoing investments in Poland. This project contributes to change the image of Polish railways. It connects rail transport with bus long-distance communication, city public transport and private transportation. “We are pleased that our steel is being used in the implementation of the most important investments that modernize public transport in Poland. Rebars manufactured in our plant were used to build the second line of Warsaw’s underground. 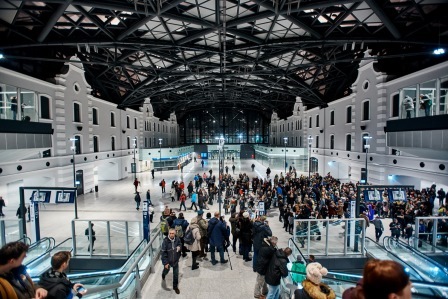 Now our rebars are becoming part of one of the most modern railway stations in Europe” says Mark Kempa, CEO of ArcelorMittal Warszawa. The numbers speak for themselves: a €400 million contract, 2,000 employees involved, 600,000 m³ of concrete…and of course our contribution: 20,000 tonnes of rebars from 20 mm to 32 mm, produced in ArcelorMittal Warszawa. The main entrance to the building is located at street level. The building is 350 metres long and 85 metres wide. Waiting area, tickets selling points, restaurants, bus station and a car park for 1,000 cars are all located 8 metres underground. The railway station with four platforms and eight lanes is located 16.5 metres underground. 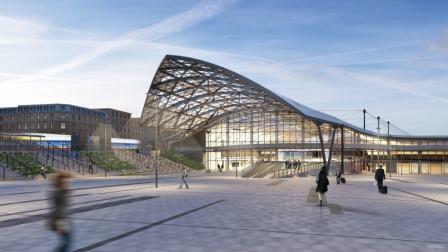 The new station can dispatch 20 times more passengers than before (up to 200,000 per day). Thanks to the transparent roof, the interior is illuminated by day light. On the station’s inner side passengers can find reproductions of the old railway station walls: prior to the demolition of the old building, each element of the architecture was documented and plaster casts were made. The “Nowa Lodz Fabryczna” project achieved its final phase with the inauguration of the station in December 2016.